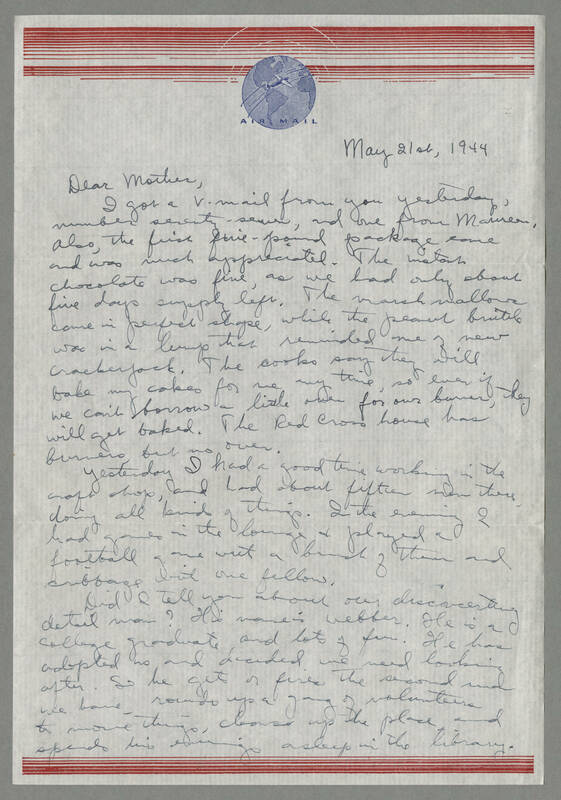 May 21st, 1944 Dear Mother, I got a v-mail from you yesterday, number seventy-seven, and one from Maureen, also, the first five-pound package came and was much appreciated. The instant chocolate was fine, as we had only about five days supply left. The marshmallows come in perfect shape, while the peanut brittle was in a lump that reminded me of new crackerjack. The cooks say they will bake my cakes for me any time, so even if we can't borrow a little oven for our burner, they will get baked. The Red Cross house has burners, but no oven. Yesterday I had a good time working in the craft shop, and had about fifteen men there doing all kinds of things. In the evening I had games in the lounge and played a football game with a bunch of them and cribbage with one fellow. Did I tell you about our disconcerting detail man? His name is Webber. He is a college graduate and lots of fun. He has adopted us and decided we need looking after. So he gets or fires the second man we have, rounds up a gang of volunteers to move things, cleans up the place and spends his evenings asleep in the library.